Entrepreneurs who blog for profit are sometimes called Blogtrepreneurs. Whether they come from a business background, an Internet marketing background, web design background, or are still in high school, anyone who can identity a niche (read: need) can turn content creation into revenue creation. In fact, that is exactly what I do everyday whether I’m actively working on a blog (or mini-site) or not. That is because blogging for profit is like a fly wheel. It takes a lot of energy to get it going (finding a niche, an appropriate domain, adding content, and promoting), but once the fly wheel is going it takes little effort to keep it going and you are free to start a new fly wheel, or blog. Niches are segments of a market and are generally well covered. Micro-niches are segments of a niche and are generally covered less. This is where blogtrepreneurs can add value to the market by helping people find answers to what they are seeking in a nook of a market segment. For example, digital cameras are a market. SLR cameras are a niche of digital cameras and NIKON SLR cameras are a micro-niche of SLR cameras. A site about NIKON SLR cameras could sell it promote or educate about the cameras themselves and about all of their accessories. I have a blog about family photography that talks about different digital cameras and techniques for taking family pictures, for example. Identifying a micro-niche is not easy, but there are many sites out there that can help you identity how to find a niche. Once you have a niche picked out, its time to secure a domain. There are still good domains to be had, but everyday there are less and less as more people gobble up the remaining ones. In the same way there is only so much land, there are only so many words and combinations of words, which is what adds to domains value over time. When choosing a domain you should include your primary keywords if at all possible. If you don’t know what your primary keywords are for your niche, stop and find out. There are plenty of sites with advice on how to choose the right keywords, which you should use in your domain. Domains can be registered at registers like GoDaddy.com, but also at hosts like HostGator, 1and1, and BlueHost. I can recommend any of these. Once you have your domain registered with hosting, you’ll want to start adding content. One of the easiest ways to do this is to setup WordPress on your server. BlueHost makes it easy with SimpleScripts, but you can install it manually almost as easy at 1and1 and others. Once WordPress is installed, you can start adding posts, but where will you get the content? Think of writing content like writing a research paper. You can’t copy works, but you can quote and reference. Ultimately you wafted to add commentary and value to the material without plagiarising. You won’t get an F, but Google may not rank your site if it contains duplicate content so write your own. For my nook covers site I pieced together facts around the web to create something whole and new and its paid off. Now that you’ve created your content its time to promote your site. Promotion starts from within and that means finding a WordPress theme that is SEO ready it making it so. I’m not going to go into SEO here, but there are lots of sites that explain all about search engine optimization. The next step is creating backlinks, which are links back to your site from other, preferably relevant, sites. Think of backlinks as votes that Google uses to decide who it should rank first for a given set of keywords. Find relevant sites to create backlinks on by commenting or by adding to a forum discussion for example. I was able to greatly increase my ereader accessories traffic by adding a link to it in a forum about ereaders. So do you think you have what it takes to be a blogtrepreneur? Don’t wait. The longer you do the more you delay getting paid and risk losing out on the perfect domain. Want more? 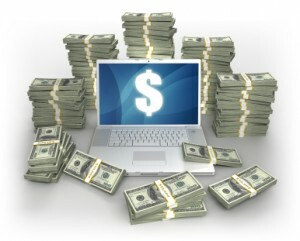 Check out my other blog on how to make money online. Research and Analysis – Identify a micro-niche inside a penetrable market that has profitable products that people are already selling. Marketing and Testing – Promote the products and test the results. If the traffic and/or conversions do not meet thresholds in a given time, start over. The rate of success with this method is anywhere between 1 in 6 to 1 in 10 and marketing and testing can take anywhere from 1 to 30 days. Success is defined as more money coming in than is going out each month and that includes all opportunity costs (time that could have been spent making money in other activities). Tracking is critical not only with the data of the results, but with the finances and time spent. According to The Thirty Day Challenge (now called simply, “The Challenge“) micro-niches are identified as the #1 keyword receiving at least 80 clicks per day and websites containing that keyword being less than 30,000 globally. 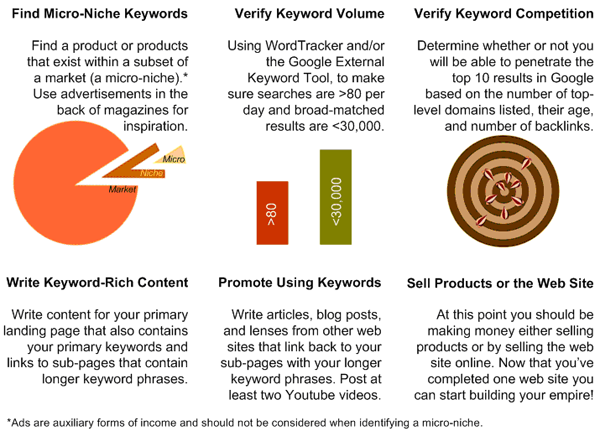 At least 3 keywords other keywords within the micro-niche with similar criteria must also be identified, if not, start over. Exists in BOTW (Best of the Web) Directory? Exists in DMOZ (ODP) Directory? Test 1: If the competition has a young domain age, a low number of back-links, and does not exist in any of these directories, then the market is penetrable. If the opposite is true, stop and start over. Test 2: Check to see that related products are both available to be sold and are being sold by others. If either is not true, stop and start over. If both of those tests pass, then make sure the products are giving a referral amount that you deem acceptable. If not, stop and start over. You now have products in a penetrable micro-niche that are profitable to sell. Move on to Phase II – Marketing and Testing. Ad copy for the products – if using Market Samurai, there are built-in features for helping with this, but you can do it manually too. Create posts (or pages) about the keyword subject matter within the micro-niche. Next, begin to create backlinks to your site by placing links to the domain, the blog posts, and the the product pages on social bookmarking, social media, and in blog comments in your related market. Be sure to add links from .edu and .gov domains. You can search Google specifically for blogs on those domains manually, but you can do this semi-automatically with Market Samurai too. Increase the number of blog posts on and off the site using other services like hubpages and squidoo – then promote all of the new posts again. Make sure you are promoting on at least 30 different sites for each post – you can use services like ping.fm or trafficbug to assist with this task. Pay to have your site listed in the Yahoo! Directory. Pay for Google Adwords or Bing (Microsoft) AdCenter. Add pictures with descriptive text to get hits from search engine’s image searches like Google Image search. Add video to Youtube with links and comment on other videos in your micro-niche. Make sure you are posting to Twitter and Facebook regularly and engaging in conversation, not just promoting. If after 30 days or at your own set threshold, you are still not receiving 200 hits or more per day, your product is not viable. Quit and start over. You have just found one of your 6 to 10 failures. If you do have over 200 hits per day, but are not getting conversions, first try changing out your ad copy, images of the products, and/or placement of the two on the page. Refer to Dan Kennedy’s sales letter technique. If after changing all three of these variables and still your revenue is below your expenses, then start over. If not, you have a profitable business. Consider selling it for ten times it’s worth and starting over using Flippa.